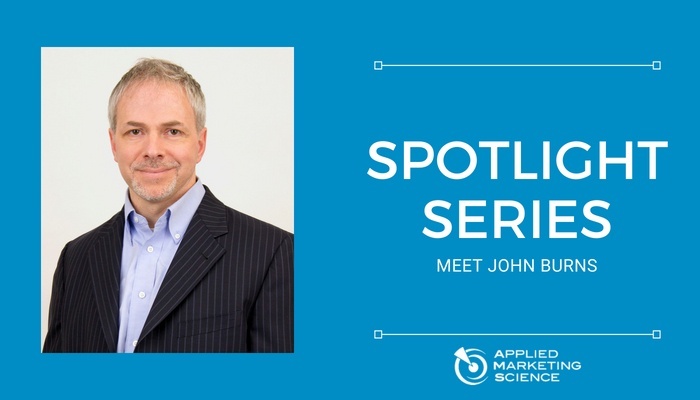 In the latest of our Spotlight Series, we’ll be speaking to John Burns, Principal at Applied Marketing Science. John has been helping companies to improve innovation since 1999. His experience and expertise cover a range of industries, including industrial products, financial services, technology, medical devices, pharmaceuticals, food and beverage and household products. Tell us about your market research background. Because I started as an academic, and have a Ph.D. in political science, my background in qualitative and quantitative social science research methods has served me well my entire career. The teaching experience I had also has been extremely helpful. I also spent nearly a decade working in financial services and packaged goods research. There, I worked on a diverse amount of qualitative and quantitative research, most of it using very sophisticated methods, some of it involving emerging techniques in neuromarketing. I got tremendous exposure to how very large, global banks and consumer products companies market to customers. I’ve been at Applied Marketing Science for the past six years. I’m frequently able to draw on my previous experience here. With the clients we work with, we have much more of an impact on decision making. And that’s tremendous. In addition, because I do a lot of our Voice of the Customer and other training all over the world, I’m able to draw on my past teaching experience. It’s all come full circle here, and in a good way. What are a few common voice of the customer mistakes or misinterpretations? It’s common today to call any kind of market research “Voice of the Customer”. The term is in common use nowadays, and it’s not going to change. But it’s also incorrect. Voice of the Customer is a specific set of best practices for conducting research to support innovation. It was all demonstrated in the 1993 article, “The Voice of the Customer,” that AMS co-founder John Hauser wrote with Abbie Griffin. They published this in Marketing Science, one of – if not the – leading peer-reviewed academic journals in market research. These methods are absolutely the best out there for conducting research to support innovation. I’m not saying other methods are wrong, but they’re not better, and most have the flaws that the article pointed out 25 years ago. I’d encourage everyone to read the Voice of the Customer article and then talk to our research and training clients. They will tell you: it works! After all, we’ve been doing and teaching this method for a long time. What is the biggest problem with research and innovation? One of the biggest problems with research and innovation is leadership. Many companies talk about being customer focused in their innovation process. Few really are. Many of those same companies don’t listen to customers at all. Instead, they rely on what senior leadership wants, on what a senior engineer says customers want, on the voice of the loudest salesperson, on what industry experts say, or on what the competition is doing. The problem is that they don’t understand the fundamental issue of what customers can and cannot tell you. If you ask customers for a solution, you’ll typically get a useless answer. No customer would ever have told you about wanting a smartphone, fully formed, back in 2003. But customers can tell you their needs. They can share their experiences from which you can identify those needs. Then, you can create innovative products to meet those needs. And I worked on a lot of research around all the music, calendar, email and other functions that became part of the smartphone. Customers easily told us about all those needs. Tell us about the training you do for AMS. We provide training to help companies conduct research on their own using the best methods available. We offer several types of training in Voice of the Customer, Customer Journey Mapping and the Customer Experience, Customer Segmentation, and Value Creation. Our well-known Voice of the Customer training covers our philosophy on customer-centric innovation and Voice of the Customer, as well as practical exercises using the best techniques for conducting this research. Students practice interviewing using our techniques, for example, and it’s typically a humbling experience for them. It’s not easy to do well. I’ve taught this course all over the world, and I have clients with examples of product and service success stories that are remarkable. Launching new products that succeed. Turning around failing or under performing products. Even changing an entire culture to make it more customer-centric in terms of innovation. I also teach courses on Customer Journey Mapping and the Customer Experience, which is a growing and important part of our training. This builds upon the fundamental research practices of Voice of the Customer, but it goes beyond that to incorporate journey maps, the customer experience, and the details of those areas of research. It’s a very exciting, rewarding, and effective course. To see customer service playbooks come out of our research is exciting. In addition, for companies with more specialized skills, I teach Customer Segmentation and Value Creation. If you’re looking for customers to give you the answer, you’re not doing it right. You can learn how to ask your customers the right questions by attending our Voice of the Customer workshop where I introduce Voice of the Customer market research and teach you to use it to accelerate innovation in business-to-business markets.